Figure for Landscape, 1960, Barbara Hepworth. Bronze. The J. Paul Getty Museum, Gift of Fran and Ray Stark, 2005.108. © Bowness, Hepworth Estate. Before treatment at left; after treatment at right. This spring we shared with you our plans for conservation work on Barbara Hepworth’s 1960 sculpture Figure for Landscape. The large outdoor bronze sculpture was deinstalled and brought to the studios of Decorative Arts and Sculpture Conservation for treatment and technical examination that spanned more than ten months. The work has just been completed, and the restored sculpture is back on view on the Fran and Ray Stark Terrace at the Getty Center. Also, the complete process has been compressed into a 5-minute video, found below. 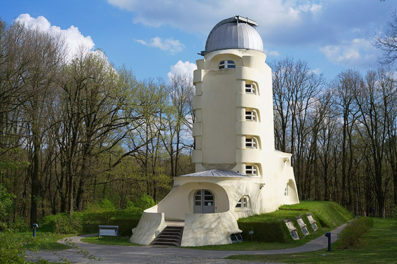 Despite regular maintenance, the sculpture required treatment because of relentless exposure to the outdoor environment. The object was structurally stable, but it was in poor aesthetic condition and actively corroding. The deteriorated coatings were flaking off the surface and concealing the underlying patina. It is natural for coatings to fail in time, and maintaining them is a large part of preserving our outdoor sculpture collection. Barbara Hepworth (1903–1975) is considered one of Britain’s most notable modern sculptors. Throughout her career, she worked mostly in stone and wood, but she began making metal sculpture in 1956. She turned to bronze because of its durability and seemingly unlimited possibilities. Figure for Landscape is a large, amorphic pierced form made of cast-copper alloy with an overall green patina, and a base with a dark brown-red patina. Reflecting her love of Neolithic stones in Cornwall, Hepworth made this composition during a time when her works offered an abstract response to particular landscapes. The form has also been compared with Rodin’s monument to Balzac in his writing cloak. There are seven casts of Figure for Landscape. She created the model during a very busy time in her life, as she was preparing for a 1960 exhibition in Zurich. Hepworth used several foundries: Morris Singer, Art Bronze Foundry in London; Holmans in St. Just; and Susse Frères in Paris. She had trouble finding a foundry to cast this bronze because they were so heavily booked. Eventually, she was able to get the Morris Singer Foundry of London to cast it a year later in 1961. The first cast remained Hepworth’s copy and during her lifetime was located at her Trewyn Studio in St. Ives, England, now at the Tate. Other casts were made over the next seven years, with the final, seventh cast finished in 1968 and straightaway displayed on the steps of the Tate Gallery for Hepworth’s 1958 retrospective. That same year, Ray Stark purchased the seventh cast. In 2005, the Fran and Ray Stark Revocable Trust donated it to the J. Paul Getty Museum. There is a range of different patinas among these casts. Regarding the first cast now at Tate, Matthew Gale and Chris Stephens write, “it was patinated green, with greater intensity on the inner faces.” The Tate Archive has a letter from Hepworth to Morris Singer regarding Figure for Landscape, noting her desire to have a “golden-brown patina with touches of the special blue-grey-green… almost a transparent patina to the glow of the actual bronze itself.” Morris Singer is no longer active and couldn’t provide any more specific evidence. In contrast, an archival image of the seventh cast from Hepworth’s 1968 retrospective captures a fairly even light green patina overall with a brown square base. 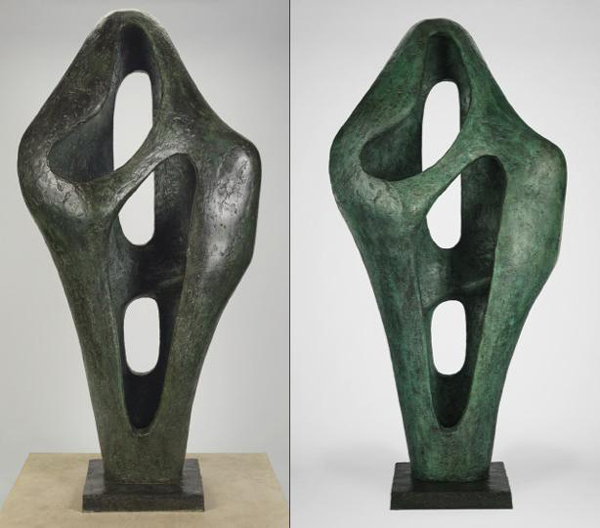 When looking at other casts, we have to keep in mind that it was not uncommon for Hepworth to use different patinas within an edition—and that the environmental exposure and treatment histories will inevitably vary. Interpreting the colors of Hepworth’s outdoor sculpture gets yet more complicated, since there is evidence in her studio archives that she occasionally used toned coatings to adjust the color of a finished work. Colored yellow lacquers from her studio have been analyzed at Tate, and coatings from Two Forms (Divided Circle) made in 1969 at St. Ives were found to contain yellow ochre pigment and cadmium yellow pigment. Since it was not clear whether any toned coatings had been used on the Figure for Landscape series, we kept a sharp lookout for any evidence of this kind when performing our scientific examination. 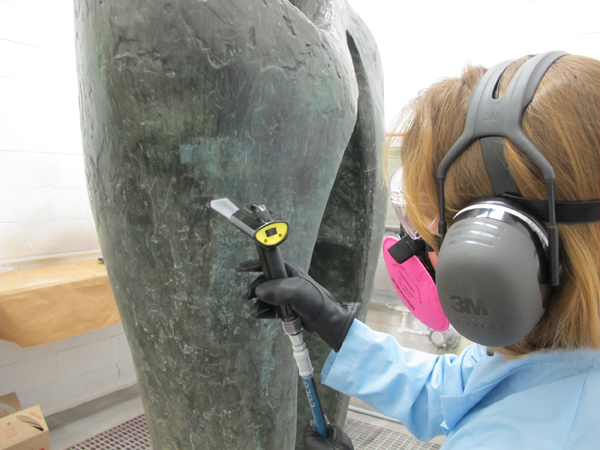 Conservators at the J. Paul Getty Museum and scientist Herant Khanjian at the Getty Conservation Institute organized an extensive study of the sculpture to learn about the fabrication, original appearance, and treatment history. The result informed the treatment methodology and strengthened our understanding of the sculpture. We have not found any evidence of toned coatings, and analysis of multiple spectra taken by energy dispersive x-ray fluorescence spectroscopy (ED-XRF) provided evidence of different chemical patinas between the base and sculpture. 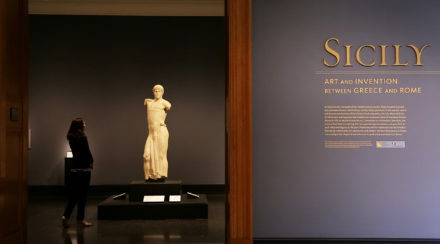 Both the interior and exterior forms of the sculpture’s surface contained similar amounts of higher chlorine and sulfur, common components found in chemical recipes for green patinas. The base showed common elements used for making a brown patina: iron and manganese. X-radiography of the structure indicated that the form was sand-cast in two sections and joined in two vertical halves. We determined that the casting alloy was a matrix of copper with the following constituents: 6% tin, 3% zinc, and 2% lead. This can be described as quaternary bronze. Approximately 1% nickel was also found, an intentional addition to the commercial alloy for the purposes of shortening the interval of solidification. The surface had several layers of coatings including wax and Incralac, a commercial brand of acrylic resin commonly used on outdoor bronze sculpture. We removed the top wax layers with dry-ice blasting and preserved the remaining coatings with solvents. Uncoated, the patina was remarkably well preserved and the appearance was dramatically changed, as you can see in the photo at the top of this post. For the most part, the patina was applied with a stippling method; it is largely intact, but there are several thin and worn areas where the bronze below is visible. The surface has a clearly intentional, even green patina with a distinct brown square base—much like we see in the 1968 photo of the seventh edition, and in line with the XRF evidence we obtained. Our final treatment steps involved a spray application of Incralac and a topcoat of wax. In her essay, “Approach to Sculpture,” Hepworth wrote about finished works that left her studio. She hoped that collectors who take custody of them display them with meaning, “not placed on a pretentious pedestal but cared for in a more intimate way.” I could not have gotten more intimate with Figure for Landscape. My appreciation for Hepworth’s artistic legacy has been greatly enhanced, and I have the sense that she (and the public) will appreciate the revitalization of the form after restoration. 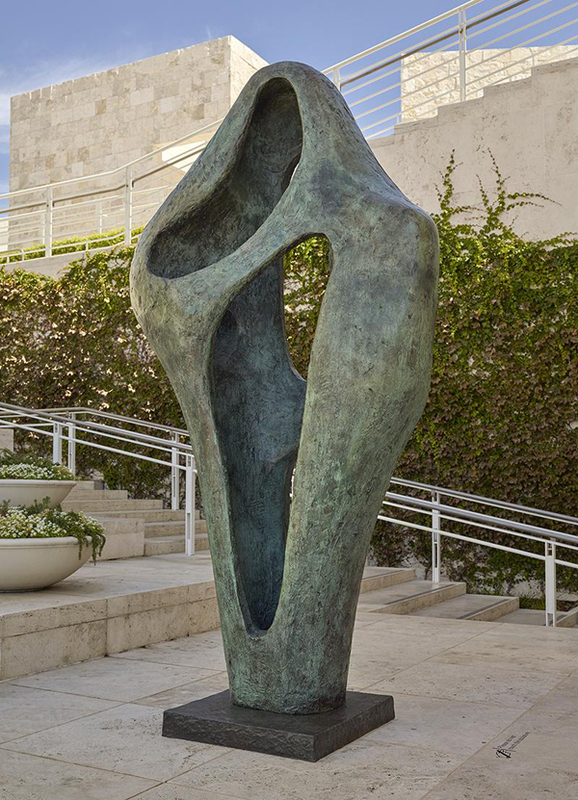 Please visit the sculpture at the Fran and Ray Sculpture Terrace at the Getty Center.